Mouth guards: Protect your Child’s teeth! Mouth guards: Protect your Child’s teeth!Mouth guards: Protect your Child’s teeth! Category: News & Blog | Comments Off on Mouth guards: Protect your Child’s teeth! Mouth guards are important in helping protect your child’s teeth! This summer, ensure your child’s teeth are properly protected with a quality mouth guard. Mouthguards help to protect teeth against injury, fracture, and breakage. Whether you need a basketball mouth guard, a mouth guard for soccer or a mouthguard for martial arts, there are a wide array of options for you and your child! Mouthguards help prevent against a wide array of injuries to your child’s teeth. A child mouth guard can help prevent lacerations to the jaw, may also prevent against TMJ (Jaw Joint) Trauma. They reduce the potential for jaw joint fracture or displacement by cushioning against possible impact from athletic activity. A properly fitted mouth guard covers the sharp surfaces of the teeth, to help protect the tissues of the cheeks, lips, gums and tongue from lacerations that can occur from a blow. This is the most commonly imagined impact when one thinks of impacts to the mouth. This impact can come to your child’s teeth from the form of an elbow, a soccer ball, or from various other pieces of sporting equipment during athletic play. Mouth impacts can cause damage to the soft tissues of the lips, checks, tongue, and gums, as well as the teeth and upper jaw. Mouth guards help to protect your child’s teeth from direct impact to the mouth. Causes possible damage to the teeth, TMJ and jaws. This impact typically comes from the side, impacting the jaw directly. 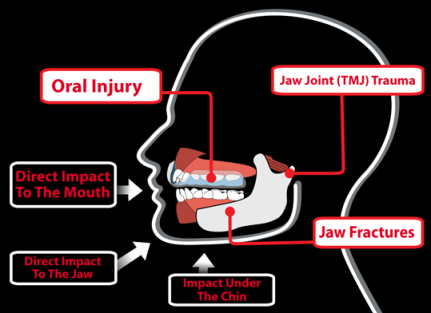 Impact directly to the jaw has the ability to cause damage to the jawbones, teeth and jaw joint (TMJ). A blow under the chin can cause damage to the teeth and the gums. However, it can also cause damage to the jaws as well as inflame or cause TMJ issues. Properly fitted mouthguards reduce the force upon impact helping to protect the jaws from fracture. There are also various mouth guard types to consider. Stock mouth guards are the least expensive. Stock type mouth guards cost about $5 and come in three sizes: small, medium and large. You get what you pay for in these in terms of fit. Some complain that they are too wide and uncomfortable. Boil and bite mouth guard such as the UnderArmor mouth guards offer a semi-custom fit can be made using a “boil and bite” model mouth guard. Hot water is used to soften the plastic and your child then bites into the guard, molding it to his or her teeth. This type of mouth guard sells for between $15 and $25 and offers very good protection. These are typically the best value, offering a competitive price point and very good protection. Custom mouth guards can be fitted custom by a dentist or orthodontist. They offer the best fitting mouth guards, and as such they are also the most expensive with costs between $45 and $65 dollars. A dentist or orthodontist makes custom fitted mouthguards in a dental office. Not surprisingly, this kind of mouth guard is the most expensive of the three, costing between $35 and $65. Custom mouth guards are the best option if your child has braces and plays multiple sports. 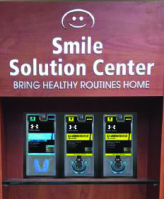 Under Armor mouth guards offer a superior protection and fit for your child’s teeth. Under Armor is the #1 fastest growing brand in sports, for athletes of all ages and abilities. The Under Armor mouth guards can be easily molded with hot water to offer your child the most comfortable fit and unrivaled protection for their teeth. Under Armor also offer mouth guards for braces as well. Under Armor mouth guards protect against all types of impact to the jaw, gums, and teeth- ensuring that your child can enjoy all of their athletic activities, all while protecting their teeth! To learn more about Under Armor mouth guards and to ensure that you child has the best in dental care, contact your nearest Great Expessions Dental Centers.